I love adding a few fun Patriotic decorations to my home during the summer months! 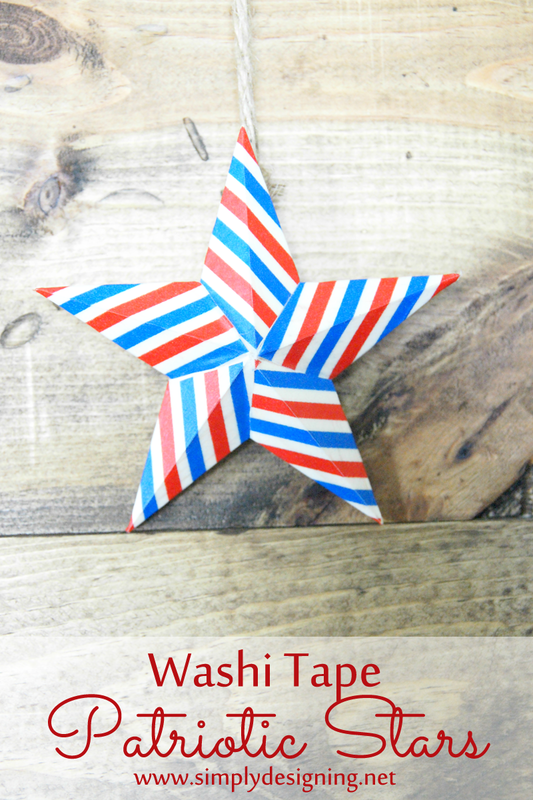 So today I am going to show you a really simple Patriotic decoration using washi tape! Woot woot! 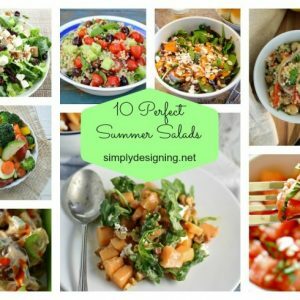 And the best part is, is that these only take a few moments to make! 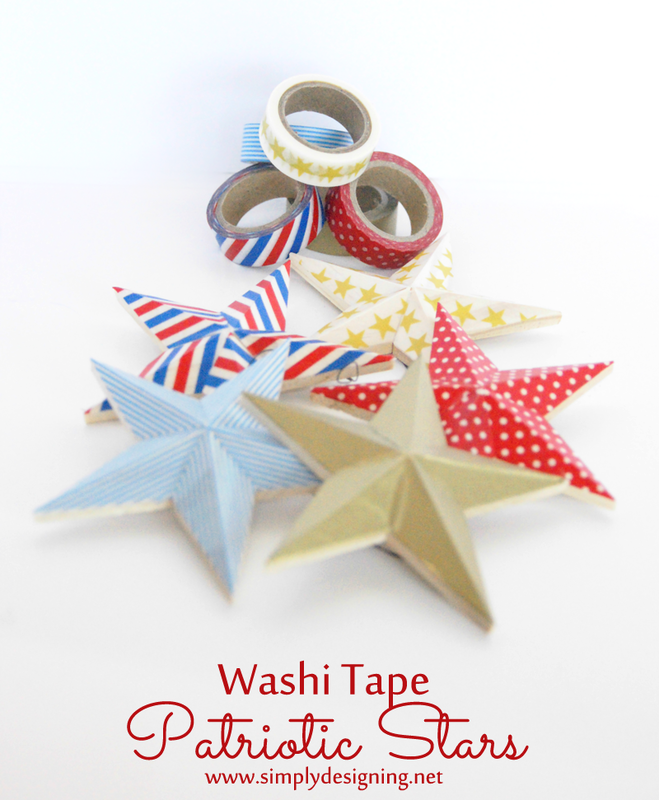 Here are my Washi Tape Patriotic Stars! 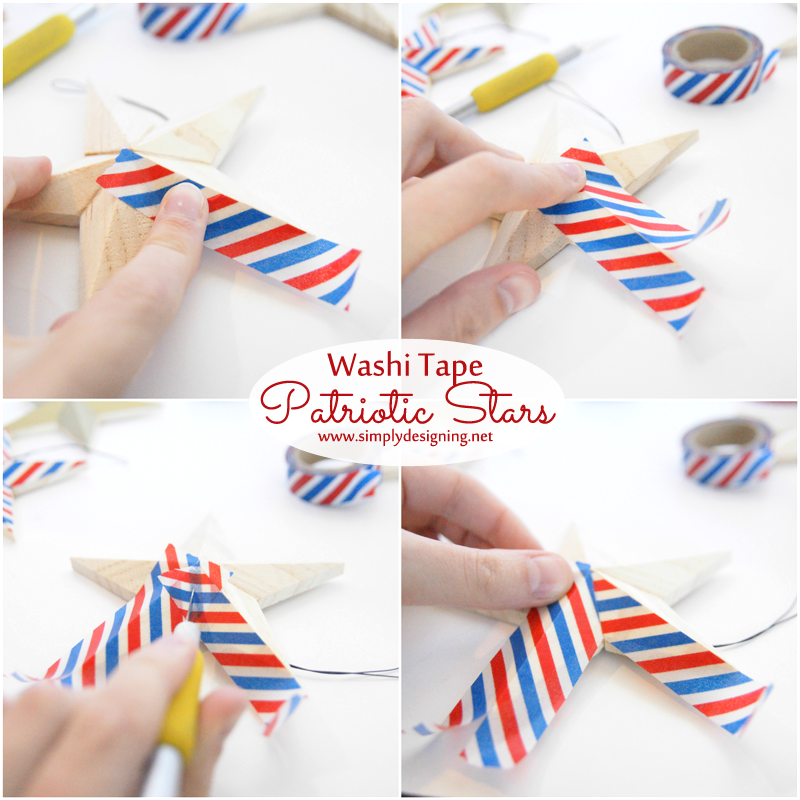 You will begin by laying one piece of washi tape, starting at the middle and going out to a star point. Line the long edge of the washi tape along with the top edge of the star. Place washi tape on adjoining edge and line up pattern if able to. Use an Xacto knife to cut off overlap in the inside corners of the star and carefully peel away excess washi tape. This is easiest to do as you go, but you can also wait until the end to trim off all the corners at once. 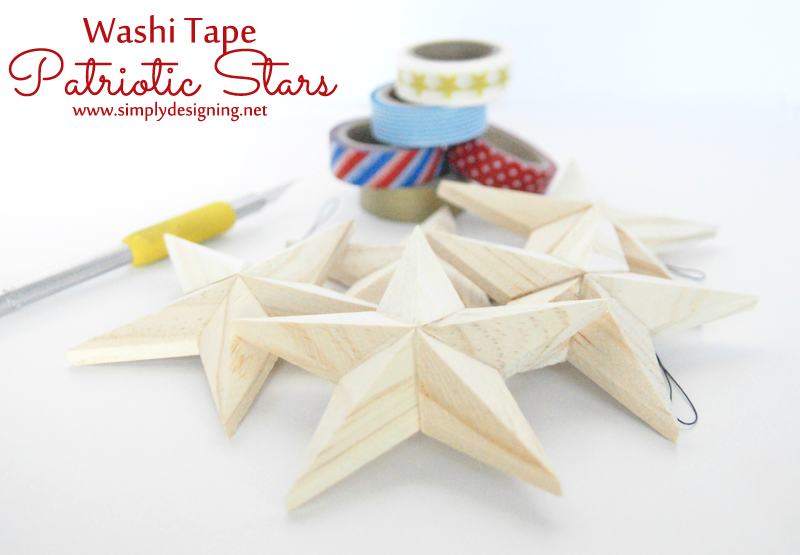 Use an Xacto knife to trim off any additional washi tape excess that may occur on the sides of the star. If your washi tape has a pattern to it, you might want to take extra care to line up the pattern when you are able to. Repeat this process until all of the stars are covered with washi tape. These stars come with a hanger on the back and are ideal for hanging! I added a piece of jute to the backs of each of my washi tape stars and hung them from a pretty pallet board I have in my family room. 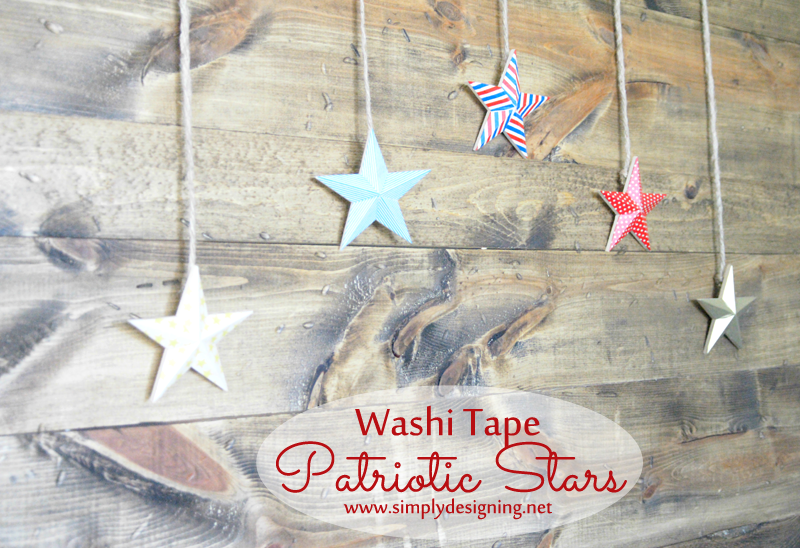 These Washi Tape Stars are a great way to add a little 4th of July fun to your space without going overboard and without taking a lot of time (or money) to create! 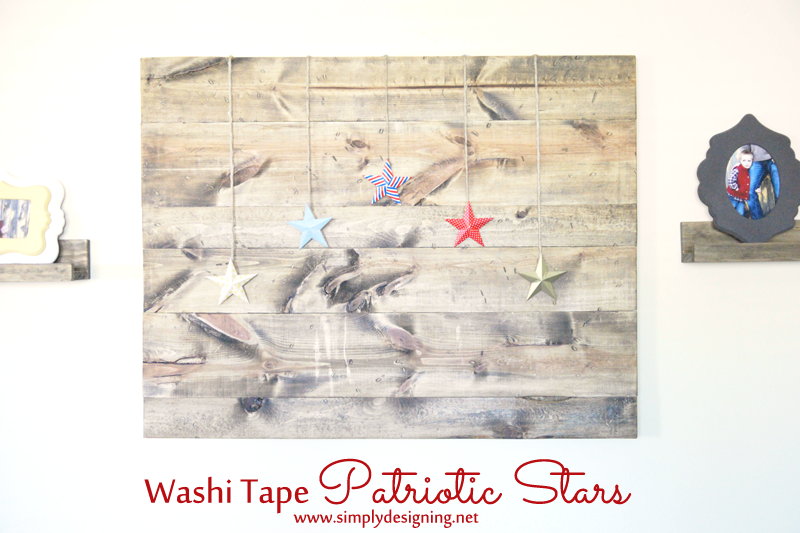 An older child can even help place the washi tape on the stars for this project! Although I would definitely leave all of the cutting up to an adult! I hope you have a wonderful 4th of July! I have so much washi tape, and I’m always looking for projects to use it! This is lovely! Thanks for the inspiration! I’m sooo in love with these stars!!! Very detailed tutorial!! 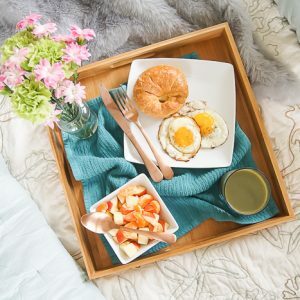 I would love it if you would submit this post to our blog! We feature great tutorials and link back to you to read the full post!! Have a great weekend! Very cute idea! Thank you for sharing at Merry Monday. Thanks for sharing these at Motivation Monday! These are beautiful! Your stars have been picked as a party favorite this week! Such a cute idea! I really love it! Thank you for linking up with Dream. Create. Inspire. Link! Pinning! What a cute idea! And I love how easy you make it look! Great idea for inexpensive 4th of July Decoration. I have seen 3D stars like this in cardboard which would be even cheaper. Thanks for sharing on our Share Your Style Party.